Dr. Shelley Collins is Professor of Flute and Music History at Delta State University, where she also conducts the DSU Flute Ensemble, teaches the history of rock, and is Chair of the annual International Conference on the Blues. Collins has served as Secretary of the Executive Board of the National Flute Association (NFA) and as President of the Mid-South, Seattle, and Colorado flute societies. She has performed and presented at eight NFA conventions; other recent performances and master classes include the University of Montana, University of Wisconsin-Eau Claire, Tennessee Tech University, and the University of Texas-Brownsville. She has been principal flute of the North Mississippi, Delta, Thalia (WA), and Glacier (MT) symphonies. Her arrangements for flute choirs and chamber ensembles are published by ALRY Publications and Presser/Falls House Press. Her articles and reviews have appeared in the NFA’s Flutist Quarterly, Flutewise, and Flute Focus. An enthusiastic and innovative teacher, her students have become successful band directors and private studio teachers, have been accepted into graduate music programs, and have won NFA competitions. She enjoys teaching music majors as well as students majoring in other fields, and she has taught flutists of all ages—from six to 83. Dr. Collins previously taught at Seattle Pacific University, Colorado Christian University, and the University of Colorado-Boulder Division of Continuing Education. As a flute ensemble conductor, she has directed the Rocky Mountain Flute Choir, SPU Flute Ensemble, and Arizona Flute Society Flute Choir, as well as leading flute choir sightreading sessions for National Flute Association conventions. A native of Montana, Dr. Collins received the Doctor of Musical Arts in Flute Performance and Pedagogy from the University of Colorado-Boulder, where she studied with Dr. Alexa Still, and a Master of Music degree in Flute Performance from Arizona State University. She earned a Bachelor of Arts in Music Performance and Music Education at Seattle Pacific University. 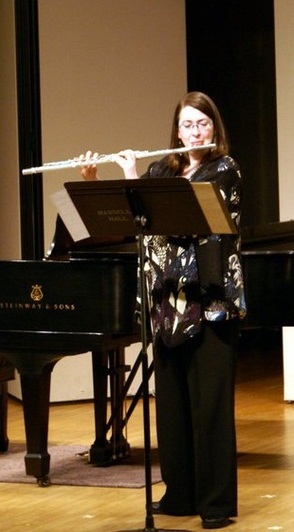 Short Bio (under 500 characters): Dr. Shelley Collins is Professor of Flute and Music History at Delta State University. She has served as Secretary of the National Flute Association and as President of the Mid-South, Seattle, and Colorado flute associations. A native of Montana, she received the DMA in Flute Performance and Pedagogy from the University of Colorado-Boulder and a MM in Flute Performance from Arizona State University. www.shelleycollins.com.